I want to give specific kudos to our bus tour driver (whose name I was positive was something like Viknik, but I grow more unsure of that). He was knowledgeable, amiable, and a very competent driver. He was also extremely considerate - after our glacier hike on Solheimajokull, we went on to see 3 waterfalls. After the first, I realized running water and a full bladder are not good bedfellows, and he dropped everyone at the second waterfall, showed them where to walk after, and then came back and drove me to the rest stop. He's my hero. Our tour guides on our excursions were also fantastic - I'm horrible at names but our guide for the ice caves was a pro driving on the glacier, even though one of the compression units on the vehicle was acting up on the way back. Our glacier hike guide, Kish, was also amazing. He was personable and had so much knowledge to share, all while keeping an eye on our health and stamina to keep us safe. Everyone we came into contact with through your bookings (including Valur) were so wonderful to us. I understand tourism is very important, but I never felt like I was just another tourist to them. Our guides were engaging and humorous and just all-around wonderful. They really made a fantastic trip that much more enjoyable. Additionally, we received our refund check for the Northern Lights tour - thank you so much (you and Disa) for helping us during the trip. I have attached some photos to this email. Everyone back home thinks I'm joking when I say it was difficult to take a bad photo in Iceland, but I'm serious. Beautiful, beautiful country. I cannot wait to go back. Thank you for all of your help throughout this process! When we first started planning our trip to Iceland we thought we could accomplish planning ourselves, however as time went on we came to the realization that we needed help. After reaching out to Nordika Travel to inquire about planning with them, Björg emailed back with all the information we needed to make the decision to move forward planning with Nordika Travel. Björg was extremely responsive with all of our questions and provided great information about the options we had in order to make the most out of our trip. The travel documents we received were extremely detailed and made it very easy to follow, whether it was picking up our rental car or checking in to all of our hotels. Our trip of 9 days, 8 nights were jam-packed. All of the points of interest were extremely well documented and easy to find once we started driving. We knew it was going to be a lot of driving, but each day had a significant amount of activities to keep us busy, yet enough down-time for when we needed it. In reviewing the itinerary, Reykjavik was planned for the final part of our trip, which in looking back was a great choice. We were able to take in nature and the beauty of Iceland throughout the first part of our trip, and finishing in Reykjavik was a great way to acclimate ourselves back to city life. This was hands-down one of the best vacations we have ever been on, and truly enjoyed all that Iceland had to offer – from the Blue Lagoon to the glacier tour to sightseeing in Reykjavik. I would highly recommend Nordika Travel and working with Björg on any travels to Iceland. We look forward to returning to Iceland for another vacation soon! We received extremely helpful and efficient personal attention from Laufey. She responded to our emails promptly and provided detailed information as it became necessary. As it turned out my friend lived in the same metropolitan area as Laufey who invited us (on the occasion of my visiting my friend) for coffee. That was a valuable opportunity to ask questions and discuss concerns in person. We also valued her advice on a number of issues and it proved sound during our trip. When I first contacted Nordika I had not decided how I wanted to travel or where I wanted to go and I was communicating with a couple other agencies at the time. Tour dates, cost and itinerary were very important to me--more important than being in first class hotels or having expensive meals. Ultimately combining Laufey's advice and my own research I selected the Country Life tour. It exceeded my expectations. I was delighted with the meal arrangements and the hotels were better than I expected given the moderate cost of the tour. But perhaps the best thing about the tour was its small size, incredible driver-guide, and the number of sites and activities worked into the tour. Meeting Icelanders was important to me, and there was ample opportunity for doing so. I believe Laufey had the ability early on to sense what would be the most appropriate tour for myself and my friend and she directed my attention to the Country Life tour early on. In doing so, she proved to be right. It was perfect for our first visit to Iceland. I won't hesitate to use Nordika again and the opportunity may well arise in the next year or two as both of us want to visit areas in the West Fjords that we missed on this tour. After I've had a chance to go through my photos, I'll share some with you if I think they are good enough to merit your consideration. The people were friendly, the landscape beautiful, and every tour that we did was well worth it. Frankly, we all said that we'd be back in Iceland again one day. Your help was invaluable. The materials that you gave to us were easy to read and very informative. We will, of course, recommend Nordika to everyone that we know that is thinking of visiting Iceland. We are back from our 16 day trip to Iceland, and we want to thank you for all that you did to make our trip so enjoyable. The route you laid out for us worked very well, (it took us a few days to realize that you had arranged daily opportunities in the order of the most efficient use of fuel), and the lodgings were all more than adequate, clean and comfortable. They were also convenient to the places and things we wanted to see.The food provided was excellent. Breakfasts satisfied three differing appetites, and were enough to last through days of travel and hiking. Evening meals were often taken at our lodging places, lots of fish and lamb, both excellent, and other choices if variety was needed. We never had a meal that was not most enjoyable. The Westfjords were outstanding. Driving there was a real challenge, adding much to the sense of adventure. The entire Country is beautiful often starkly so. The people are friendly to visitors, and everyone spoke English fluently. Waterfalls and glaciers, landscapes and seascapes that are breathtaking. Lots of free ranging sheep and beautiful Icelandic horses - neither of which were a problem to careful drivers. 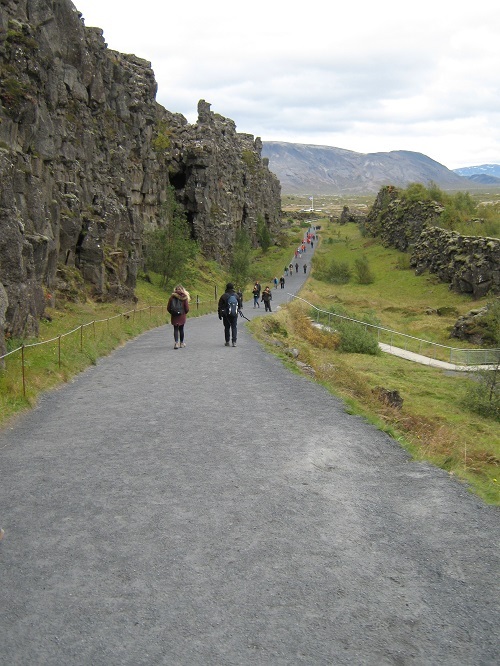 Museums and historic sites - everyone should experience Thingvellir. Reykjavik, most people's first stop, was our last. The hotel Fron gave us an upgrade to an apartment. Really nice! Our daughter called ahead and reserved a parking space, which was an excellent idea. One problem, the street in front of the hotel was closed off by a gate - we had to drop our daughter off to walk to the hotel and find how we could get to the parking lot. The location of the hotel could not have been better, right in the heart of the excitement. We definitely could have spent more time there. I could go on...and on! In short, 16 days was not enough. It was a whirlwind tour...and we enjoyed every minute of it. We are all in agreement that we want to return to Iceland and spend more time, seeing and doing things we missed. When we do return, we will use your expertise to assure another great trip. Again, Thank You, for all that you did. Our trip to Iceland was amazing! Everything flowed perfectly and we didn't have any issues with the arrangements Nordika made. Hotel Alda was well located and had nice amenities. We also liked the hotel sel mývatn.- We were pleasantly surprised to find out that dinners were included in our stay there and the hotel staff was very friendly and helped arrange some additional tours for us. All of the instructions from Nordika were spot on, we never felt lost or confused about where to go. We enjoyed our private tour around Akureyri and Lake Myvatn- the local guide was very nice. The 3 day tour (South Coast) was great too. We didn't get to see the northern lights, which was a little disappointing, but nothing you could have done about that! All in all it was a great trip and I cant think of anything that could have made it better. I would love to make another trip to Iceland to see more of the country and wouldn't hesitate to use Nordika again to help with the planning. Iceland is one of the best tours I’ve ever done. I can’t begin to tell you how great out trip was. Your country is amazing. Every day was a new adventure & I can’t even express my gratitude for all your help in planning and executing our time around the island. (Our only difficulty was WOW airline. They are terrible & you didn’t handle that part of the trip.) What you did was perfect! We never had a problem at any point in the trip. Iceland’s people are great. We were treated so well everywhere we went. The food was incredible. I have never had such great meals. And the country did not disappoint. It was ever changing; a visual delight – both beautiful & fierce. The wind!!!! But we prepared with our winter gear and there were no problems. Fun at Lake Myvatn with Anton was GREAT! He made Laura’s birthday perfect. This is a quick thank you. When I have time I will send you a proper letter. I can honestly say Iceland is one of the best tours I’ve ever done. Overall it was a wonderful trip. The beauty of the landscapes was breathtaking and the people we met were kind, helpful and had a great sense of humor. Hard to believe we have been home a week already. Wanted to send along some thoughts about our holiday in Iceland before too much time had passed. To begin, I want to thank you for all of your support planning the logistics. You offered up many great suggestions and were patient, flexible and timely in your responses as we worked out the final itinerary. We were fortunate to have Valur drive us to and from the airport, between hotels and around the Golden Circle. He was quite knowledgeable, always on time (if not early) and had a nice, easy going manner. An excellent traveling companion and a true gentleman. We were also very fortunate to have Ulfar from Iceland Activities as our guide for a couple of days. He was a great combination of a highly skilled outdoorsman who took every step to ensure that our family was warm and safe during each activity and a genuinely kind and fun person who treated us as more like new friends than customers. While we enjoyed everything I would say some of the more memorable activities Included the mountain bath with the leg of lamb cooked in the ground and the snowmobiling on the glacier. Beyond those we loved seeing so much natural beauty including mountains and waterfalls and black beaches and, of course, the Northern Lights, which had been on our bucket list. We saw them on a couple of nights when staying up in the mountains at the Frost and Fire. Just stunning to see. In closing I can tell you that our family will long remember our trip to Iceland and we will gladly recommend Nordika Travel to anyone interested in planning a trip of their own. Thanks so very much for everything. This is a full-service agency and the service was excellent. We were VERY happy with our travel arrangements! We were a family of five with only three nights in Iceland. The goal was to see the Northern Lights, and so we wanted to spend some time outside of Reykjavik. Laffey at Nordika Travel suggested our hotels and I have to say that the hotels were so lovely that it pained us to leave them! We spent two nights on the Golden Circle and did see the Northern Lights because our hotel offered “wake up” service. We spent one night in Reykjavik and that hotel was great too – right in the heart of everything with a vibe that kids (in their 20s) loved. Laffey also suggested so many things to do that we had to pick and choose which ones. We like that. We felt that we could improvise because we could easily substitute one activity for another. Our car, a Landcruiser, was sufficient for the five of us and our luggage, with little room to spare, but it worked! I will book directly with them again when we go back! My husband had been dreaming of Iceland for decades. We went thru a local travel agent who said she had this exclusive relationship with someone in the know in Iceland. Well that someone was Nordika and they were great. The roads washed out due to a storm and they tracked us down, tried incorrect emails from my agent and finally thru my office staff to let us know what had happened and how they had set up for us to fly back to our starting point. That was a packed plane and WE HAD SEATS then we went round counter clockwise. IT was wonderful! I really like that they use local merchants when they can and not big chains. I will book directly with them again when we go back! I finally got a chance to sit down and give you some feedback on our Iceland trip June 6th to June 21st. To try to sum up the experience in words is difficult. The entire country is like being in a national park. Literally everywhere you turned there was another photo moment. The mountains, the coastlines, the fiords, the volcanic landscapes, the glaciers, and the waterfalls will cause your senses to go on overload. We found the country to not only be beautiful, but safe, friendly, and white glove clean. The accommodations were spaced perfectly throughout our trip and we found them to be exactly what we needed at the end of each day. Each place provided us with a place to unwind, rest, edit and post all of the day’s pictures, and enjoy unbelievable gourmet meals. I can not complain about any of the guest accommodations. The room at the place we stayed at Myvatn Lake for two nights was pretty small, but I think we had our most memorable meal there. We did the “Into The Glacier” tour in the beginning of the trip and found it to be a different experience, but we both found that we liked the natural things around the country better than the man made tunnels into the glacier. They told us that they will take 250 to 300 people through the tunnels in one day. The tour was everything they said it would be, its just that we appreciated more sitting on an island cliff watching the sea birds coming and going with the luxury of very few other people around. I especially enjoyed the Northwest Fiords and if I go back I would spend more time there as well as all of the Northern Iceland areas. We found that getting more than a day away form the capital provided us with experiences with less tour buses and people. We booked a tour to Drangey Island above Saudarkrokur, on our own, to see Puffins and found the father and son guide team to be exceptional. The climb up the side of the island involved some ropes and landers to hang onto, but even my wife was able to make the climb. You might consider adding that tour to someone else’s trip. Another good puffin stop for us was in Borgarfiordur about one and a half hours out of Egilsstadir. We used the Ambassador Whale Watching Company out of Akureyri, on their first trip of the day using the RIB boat and saw seven different whales. They were exceptional and the city of Akureyri was a place I would go back to and spend some extra time. We found the Jarobodin Nature Baths to be perfect. Not as crowded or a commercial as the Blue Lagoon. The birds were just awesome during the entire trip and I was able to add 25 new birds to my life bird list. We found the whale museum in Husavik to be a must stop for anyone getting to that area. One of the highlights for my wife was the Iceberg Lagoon trip. That whole glacier area is breathtaking, but to take the Zodiac right up to the glacier and the ride around the glaciers is also a must. I would definitely recommend the Zodiac over the Duck Boat company because they cover much more area. We even drifted up to a number of seals on the icebergs. All of the waterfalls were inspiring and it is hard to pick a favorite because they are all so different, but the one that will over powered you was Dettifoss and Selfoss. The black beaches at the end of 215 past Vik, probably was one of the most inspiring landscapes. If only there had not been a new restaurant and an invasion of tour buses there it would have rivaled what we found in the north. Even with those distractions these black beaches must be seen by anyone traveling to iceland. The Great Geysir area was okay, but after traveling extensively in Yellowstone it does not compare. The Gullfoss waterfall on the other hand is a must even if once again you have to deal with the tour buses. Probably our favorite harbor area was Stykkisholmur and the view from the lighthouse hill back over the town makes for a tremendous photo opportunity. We drove back to the Ondveroarnes area at Snefellsjokull and discovered just breathtaking cliffs and beach areas as well as the cliffs at Arnarstapi. Time would not let us go to the cliffs a Latrabjarg, but next time that will be a priority. The RAV 4 we rented worked out perfectly and we adjusted to the driving conditions of some of the roads pretty quickly, although I must say the two-way traffic in the one lane tunnel going to Isafjordur caught us a little off guard. We found also planning for gas became as important as planning our accommodations and we made use of the N 1 gas cards exclusively. Warn people about credit cards from the states without pins and tell them about these gas cards. Disa explained all of that to us before the trip and we were prepared. Also the sheep on laying on the main highways created some interesting moments. There were only two hiccups in the trip. The first one was that Hertz did not give us a portable GPS and we didn’t discover that the onboard navigation system was not activated until an hour out of the airport. I didn’t question them at the desk when we picked up the car, because I thought the car navigation system was what we were to use. I had planned everything so well with satellite printouts and research of hotel sites and tour spots that our maps were all we needed. Hertz did ask where the GPS unit was on return of the car, but I explained to them that the counter person never gave us one. They apologized and we left it at that. The second hiccup was the Inside The Volcano Excursion that we were to do on June 20th. When we woke up that morning it was pouring with 35 mph winds blowing the rain sideways. My wife refused to go under those conditions and we called their office number starting at 7:00 AM. Finally at 8:00 AM we got a live person. They told us to put the cancelation request in writing as an email. We included the voucher number, our names, and the Nordika Agency name as our suppliers. As extreme as the weather was that morning I doubt that they took anyone up that mountain. Anyway we were aware that we had prepaid the tour and we don’t know if they would have by chance refunded the money to you. It was the only disappointing thing about the trip, but we were able to use the time to go into the Iceland National Museum. Disa did a tremendous job setting this trip up for us and she did it on fairly short notice. She was able to get two awesome hotels when they suddenly became available and rearranged the itinerary to make use of them. Everything was spot on from the suggestions for side trips to supplying us with the materials we needed to make this all run smoothly. The booking of Iceland Air directly out of Philadelphia made the trip easy with no hassles. I would hope that the airport soon catches up with the volume of traffic moving through it on a daily basis. The airport is a little scattered, confusing, and provided no seats at the gate area, which really was not a gate since our plane was parked at the outskirts of the airport leading to a late arrival of the fuel truck. To put things in perspective I would say this was a trip of a lifetime and definitely should be on everyones bucket list. I will recommend Nordika to anyone who asks me about our experience. Hopefully Disa will see this and know how much we appreciated her hard work. ... made our trip exceed all our expectations! I am pleased to provide a review of our recent wonderful10 day trip to Iceland. First of all, a huge thank you to Kristen for her exceptional service in coordinating our trip. Kristen's responsiveness, local Iceland knowledge and input/recommendations, professionalism, positive attitude on EVERY interaction, and most of all her patience for answering all my questions and inquiries, made our trip exceed all our expectations! In summary, all the services, activities, and everything we did was coordinated beautifully. We had absolutely no issues whatsoever. Our airline flights were all on time, and the Hertz Rent-A-Car was ready (thank you Kristen for seeing that we had a bigger car and was a diesel -- I quickly found out about the diesel getting better mileage and was nice with the bigger car for our luggage/comfort)! All the accommodations were exceptional. The Inns and Hotels were all very nice, clean, and staff very nice and helpful. Having the breakfast included each morning was great! I got to try some new things for breakfast, too!!!!! The activities we set up ahead of time -- the Blue Lagoon, trip to Westman Islands, and Zodiak Lagoon Boat Tour were all exceptional as well. All reservations for the activities (and accommodations as well) were all waiting for us. The Detailed Itinerary was fantastic --- we used that as a guide every day, and usually picked out 2 or 3 of the recommended sights/activities each day. Having spoken to Kristen about her insights into the sights/activities truly helped us see the things we were most interested in. Thank you again Kristen! (We also appreciated the Tour Guide w/ maps, and other documents provided ahead of time (driving tips, traveling in Iceland (weather, money exchange, etc.) were extremely helpful). Finally, given the exceptional service provided by Kristen and the Nordika Team, I certainly believe that Nordika's pricing was very reasonable, and truly we got a great value!!! In closing, when we first decided on a trip to Iceland, I contacted several Iceland Travel Teams. From the very beginning, it was clear Nordika Travel stepped up above and beyond others. Kristen even proactively contacted me early on to answer my questions, help design the best trip/activities for us, and genuinely worked for our business. Needless to say, I made the right choice!!!!! Thanks to all of you again, and again a special thanks to Kristen! You made my daughters and my trip a vacation to remember for a life time!!!! You made this trip easy, so much fun and a real treat. We had a spectacular time in Iceland. Each of our guides and drivers took very good care of us. They were all on time and made sure we had everything we needed. Our hotel was perfect. The location could not have been better. The staff was helpful, kind, and knowledgeable. Breakfast was good. The rooms were comfortable and had everything we needed. Our driver Snyvarr (not sure of the spelling), from Mountaineer Excursions was great! We had a beautiful day with him and snowmobiling on the glacier was an experience none of us will ever forget! Unfortunately, the weather out to the Peninsula was really very bad. Lots of driving rain, low clouds and not much visibility. We did get a rainbow! The guest house was clean and comfortable, dinner was quite delicious with fresh caught fish, and we enjoyed meeting the staff and talking to our guide, Chris. I will put this on Trip Advisor, but I wanted you to know that you did a wonderful job and I would recommend you to anyone who asks what they should do about going to Iceland....they should call Laufey. Plus, we learned that your mother is a famous singer from Iceland!!! Thanks again for everything. You made this trip easy, so much fun and a real treat. I couldn't have asked for more....except those Northern Lights, which I'm pretty sure you are not in charge of!!! Best wishes, Cathy. Overall: Our Trip to Iceland went very well. Working with Ms. Laufey Eydal was super. She is very professional and knowledgeable of Iceland. She responds very quickly to texts and messages and keeps you informed at all times of the status of requests. She also, took the time to research for a tour with a photographer to chase the Northern Lights. Her advice was right on to book with the photographer tour to look for the Northern Lights the first night arriving to the City. My husband and I were able to see the Northern Lights for the first time that night. I got emotional because we were so lucky. We have heard that the weather was not the best before us arriving and I was worried, but at the end it paid back. The Northern Lights – Photography Tour with Arctic Shots was excellent. The mini bus accommodation was very good. The Driver and the Tour guide Siggi were very helpful and they did everything on their part to assist everybody in the group on setting their cameras and equipment and giving instructions and tips on how to focus to be able to photograph the Northern Lights. That was one of the highlights of the trip for my husband in that he is an amateur photographer. I would definitely recommend any one to take this tour to have more chances of seeing the Northern Lights. The Blue Lagoon – Luxury Entry was a great option. The decision to stop by before getting to our hotel at Reykjavik was the best. We were able to relax, use the room to shower and change. Also, the food at the Lava Restaurant was very good. We had a very good experience on the Super Jeep & Hot Spring Cooking Tour. Ulfar Jon Andresson, the owner and tour guide was very nice. You can tell how much he loves the outdoors and where he lives. He explained the geology of the area. We hiked the most beautiful areas that the Hengill Volcano has to offer. He cooked our meal of boiled eggs, tomato soup and leg of lamb in the ground hot springs. The leg of lamb was the best one I have ever tasted. Another Tour that we will recommend to anyone that wants to do something totally different when visiting Iceland. The tour with Mountaineers of Iceland was also a good one. My husband wanted to ride in a Super Truck after seeing some photos of the trucks on the internet. The Golden Circle was beautiful and we took pictures of the Gulfoss Waterfalls and the Geysir Hot Springs. Valur Armann Gunnarsson our driver was very professional and provided us with a lot of good information about the politics, culture, history, etc. We had private transfers with him on the whole trip. He was always on time and very friendly. He always answered all our questions and has a good sense of humor. He was very accommodating with our requests to stop to take pictures along the way. The Hotel Grimsborgir was excellent. The accommodations, the food and the service were outstanding. That was another great selection from Laufey. The place and the surroundings are so beautiful. I was able to see my first White Christmas there, made my first snowman and made my first snow angel. We also, were able to see and pet the Iceland horses on our way to the hotel. Hotel Hilton Canopy was very modern and chic. The breakfast included with the reservations had a great selection. Our dinner the last night was excellent. The Restaurant Manager and the staff made my husband’s day when they acknowledged his birthday. All the staff was very friendly and helpful. The Hotel Holt accommodations were nice. The hotel is in a very good location in a tranquil area and still is closer to the town, stores and restaurants. However, we were very surprised and we didn’t feel welcome and felt insulted when the Restaurant inside the hotel didn’t accommodate us for dinner on December 23rd. We were not aware that that is a very busy day for all Icelanders and that they go shopping and eating out on that day. Even after we explained that we have been staying in the hotel they didn’t try to assist in any way. Then we went to the front desk and the lady told us that the hotel has nothing to do with the restaurant. When we asked what she recommended for us to do she told us to go to the town and see if we can find a place to eat. She didn’t offer to help us to find a restaurant that was able to seat us, get a taxi or nothing. It really surprised us that a hotel that has a four star rating treats its guests that way. We will never recommend that hotel to anyone visiting Iceland. The Lutheran Church was closed to the public until 4:30 PM and the Perlan Glass Dome was closed until the 27th. We should have been notified that those places were going to be closed so we could have made other plans. Not even the Tour guide was aware. He told us to get back with our travel agent and ask for a credit. Recommendation: My husband and I would like to thank everybody that was involved in coordinating our trip to Iceland from Nordika Travel. We were so happy to be able to visit a place that has all this beauty. Seeing the Northern Lights, the mountains, volcanoes, geyser, hot springs, etc. has been an extraordinary experience. Since we are back we have been telling everybody that they need to visit Iceland and to contact Nordika for the coordination of the trip. I know it doesn’t matter the season, as is always going to be a fantastic trip. Thank you again and good luck to your staff. You can use us as a reference. I will send some pictures from the trip. Iceland is spectacular. Can not wait to go back. We had a terrific time. The trip was well organized from start to finish. We did the self drive southern Iceland tour. The car was ready as soon as we arrived. The day to day itinerary was well planned out and the directions were easy to follow. All of the hotels we stayed at were conveniently located and nice and clean. We ended our trip with a day at the Blue Lagoon. All of the arrangements were made by Nordika Travel. They were extremely helpfuI from start to finish! I would recommend this travel agency to anyone. And Iceland is spectacular. Can not wait to go back. Will send pictures. They were herding the sheep as we drove up and we were able to see the sheepdogs at work. The trip was great. Loved it. I would recommend it and your travel company to whomever is interested in seeing a beautiful country with pristine wilderness first hand. I just wish we could have stayed longer. It would have been nice to have an extra day in each area for more opportunity to explore before driving on to the next place. The accommodations were enjoyable everywhere with the exception of the Fosshotel Glacier Lagoon. Although physically very comfortable and with outstanding food, the ambience was startling to say the least. They have taken the volcano motif to quite an extreme. The starkness of the décor was a bit unsettling with unpainted concrete walls in the bedroom to the lava lamp in the ceiling. I was surprised. However, the staff were very accommodating and there did not seem to be many hotel options in that part of the country. Perhaps on a future trip, you could arrange another farm guesthouse in that area instead. I enjoyed our stay at the Guesthouse Stieg ( the sheep farm) very much. They were herding the sheep as we drove up and we were able to see the sheepdogs at work. The family were all very charming and we were served an excellent dinner that night. The hiking in that area was really excellent. Wonderful views of the mountains and the ocean. In addition to the driving we made time for a seal watching tour and, on our final day in Reyjavik, a whale watching tour as well.. The car we got was a Subaru - very satisfactory - really a pleasure to drive. We were struck by how quickly the scenery and also the weather could change, but no mishaps occurred and we enjoyed the self driving very much. The GPS worked well for most of the trip with the exception of the final morning when we were trying to get from town to the airport. It took us to the wrong one; probably we somehow misprogrammed it. All in all, it was a great trip. I'd like to repeat it. Hopefully, that will come to pass. Thank you for all your assistance in the planning and the reservations. Floating in this old swimming pool and looking up at the absolutely gorgeous mountain valley was worth the trip to Iceland. I am finally getting back to you with some feedback from our trip. Laufey was wonderful to work with. She responded quickly to my many questions. Her recommendations on things to do and places to see were very good. In hindsight, I wish I had asked Laufey for more suggestions on out-of-the way places to avoid the tour buses. Wake Up Reykjavik Food Tour with Egill was a fantastic way to explore Reykjavik and enjoy good food along the way. Egill was full of fascinating stories and history and really made the tour special. By the way, this was a brilliant way to cope with jet lag. We arrived in Iceland early that morning and went on the food tour at 12:30, which lasted until 5:30. Thank you, Egill! Many tourists, when leaving Reykajvik to drive around Iceland, want to take the shortest routes. Don’t do this. Instead of driving through the tunnel (Route 1 just North of Reykajvik), turn right on Route 47 and drive the long way around the fjord. It is a beautiful drive; stop and enjoy the scenery. If you get started early in the day, you will have the road all to yourself, even during the busy summer months. Best of all is Glymur Waterfall at the bottom of the fjord. Because the hike in and out will take two hours, there won’t be any tour buses. No crowds. It’s a lovely walk for the first part (the flies can be annoying, but don’t bite). Then it gets fun! Go through a cave, cross the river on a log, go up the mountain using ropes for hand-holds. The view of the waterfall AND the view back towards the fjord is awe inspiring. Take a picnic lunch and enjoy yourself. Plan on spending longer than two hours. Glymur Waterfall is worth it. The Deildartunguhver Hot Spring is for looking, not touching. Too hot. If you want some silly fun, visit this hot spring in the evening when the sun is behind it. Then take pictures of your friends in the steam with the sun behind them. Even sillier, take a slow motion video of your friend walking out of the steam towards you, with the sun behind them. Set to music and post to social media. The Hverinn Restaurant has the best burgers and fries. Located near the Deildartunguhver Hot Spring near the junction of Routes 518 and 50. Jokulsarlon Lagoon feels very other-worldly. Giant chunks of glacial ice floating around. There were ducks and ducklings. The ducklings were adorable as they clambered up on the ice and jumped into the water. We even saw a seal. Walk out to the ocean beach for a view of the glacial ice floating out to sea. Some pieces were washed up on shore. We found one with a great big hole melted through it and used it to frame some pictures. Seljavellir Swimming Pool was my absolute favorite. Located on the South Coast, it is a 20-minute walk into a mountain valley. Don’t worry, it’s an easy, mostly flat walk. But not suitable for strollers. This is another place where the tour buses don’t go. Seljavellir is a naturally heated swimming pool built in the 1920s and is maintained by volunteers. Kind of grungy, and totally charming. It is free, but bring some cash to leave in the donation box. There were a lot of people there when we visited and everyone was nice. Floating in this old swimming pool and looking up at the absolutely gorgeous mountain valley was worth the trip to Iceland. We are in Iceland and enjoying our trip tremendously. We are in Iceland and enjoying our trip tremendously. The detailed itinerary that you provided us is fabulous. Today, which is Day 3 of our trip, we did the Magical Glacier Hike with Summit Guides. We enjoyed it very much and our guide was fantastic. After the hike, we realized that we were scheduled for another glacier hike on Day 11 which is Saturday, August 13. After doing the hike this morning, although we thought that it was a great experience, neither of us have the desire to do another glacier hike. So we are, therefore, asking that you cancel on reservations with Glacier Guides scheduled for the Glacier Explorer. We would appreciate your help in making the cancellation and refunding the funds that we have paid you. Anxiously awaiting your response. Again, thank you so much for your planning and providing so much information for this wonderful trip to Iceland. Peggy and I want to tell you what a nice journey we had to Iceland. The schedule was ideal, the hotels very nice, and the guides excellent. We especially liked Mink Travel, Kari, as he really personalized the trip and allowed us to see true glimpses of Icelandic life - we even saw his home, met his family, stopped at a vacation home, and saw first hand a cattle farm and Icelandic hot tub. The other parts were fun as well - the Secret Lagoon (and "Sicko" the guide) were quite nice too. Thanks for putting together such a nice trip. We've returned and had a fantastic time! Thanks very much for a great vacation. The flight was fine - the "Northern Lights" lighting on the plane put us in vacation mode and our interest was peaked by the Yule lads napkins. Meat Hook!? Food - my goodness! 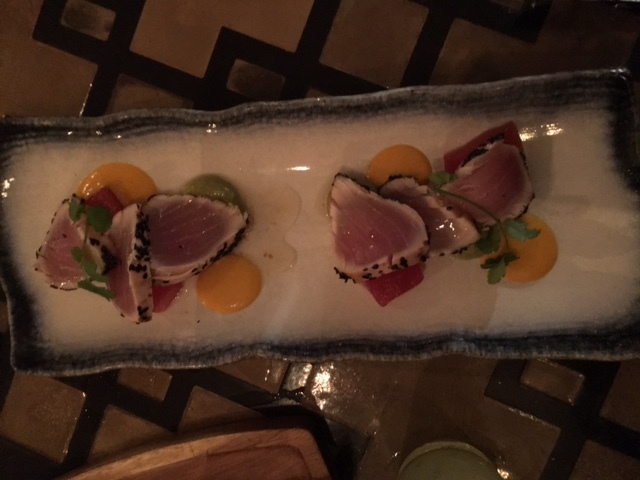 we ate like kings - a few pictures of that too. I am in love with plaice fish and cannot figure out why we cannot get it here in the US. The Apotek restaurant was sooo good! We dined there twice - if you are booking for foodies, it is helpful to let clients know that they need to make reservations for weekend dining. They have a six course Icelandic Tasting menu to die for! Once again for foodie clients, this is a must! While I didn't try the Minke whale, Carolyn did and we both tried the Puffin, although I felt guilty for some reason. We went first on Wednesday with no problem. We didn't have a reservation for Friday night (didn't occur to us that we would need one) so we just stood around looking sad and devastated - they eventually took pity on us and gave us a table! Loved the Icelandic hot dog too that we had at one of the little shops near our hotel. The tours -SouthCoast Adventures was our favorite. To add to the adventure of it all we got stuck in a serious snow storm the second day- one of the vehicles in our group broke down on the way back to the hotel Ranga (the vehicle pictured below) and one of the rescue vehicles broke down! Eventual the boss came out to meet us to get us back to Hotel Ranga. Through it all - the driver/guides were calm and professional. The other guide with our convoy, Magnus, was AMAZING. So up beat, friendly, knowledgeable, and self-assured. Just the person you want to be with in a pinch. IF they were ever concerned abut our safety, they never showed it, which kept us passengers calm. Well, there were some nervous Brits with us but I think maybe it was their first wilderness experience. It also didn't hurt that our guide on the two days with SouthCoast, Hjalmar, was so darn cute!! He was very knowledgeable too about the country, customs, etc. The first day it was just the three of us, the second day we were joined by 4 other people in our car. Magnus had four clients in his vehicle and we met up with a guide and a few people with Super Jeep tours on our way to the volcano. A fortunate occurrence meeting up with the Super Jeep tour company, because when Magnus' vehicle broke down ( due to him taking the lead pushing through the waist high snow) they were able to get into the Super Jeep vehicle. Don't know what they would have done without that blessing of a third vehicle. So in the dark, with waist high snow, vehicles getting stuck, at least four times one car had to tow the other out of a snow bank, and Magnus riding OUTSIDE of the first vehicle to spot for the guide driving since it was a total whiteout with the snow storm, we eventually made it back to the main road where we all transferred into a vehicle driven by their boss. Who was also so cheery and jovial - honestly he reminded me of Chris Kringle aka a young Santa Claus or at least what one would imagine him to be. Crazy and super exhilarating! So, so glad that we went with the smaller tours. We saw some of those 60 person buses moving around - no thanks. Icelandic Expeditions - Our guide Kommi was interesting, engaging and even sang us an Iceland lullaby. He and his brother were bound and determined to make sure we say the Northern Lights and we were extremely appreciative of their efforts. They took the photos that I sent in my first email - we would not have had documentation of that night without them. Didn't occur to me that I couldn't take a picture with my iphone. Lesson learned for me. We didn't go caving due to the extreme weather and honestly after he described it and showed us pictures we weren't too disappointed at what we'd missed. Instead, we sipped hot cocoa under the stars and Lights. A perfect ending to our Iceland adventure! Hotel Ranga - Another lovely hotel and wonderful staff, Fredrick is a gracious host. We upgraded to the deluxe twin on check in - definitely worth it to have that extra space. We were lucky enough to be there for their weekend Christmas buffet - another must if the timing is right and also requires reservations. Blue Lagoon - Taking the big bus was fine for this and we are glad that we went early. A fair number of people but not too crowded so we were able to get checked in and changed rather quickly. About an hour in the lagoon and then another lovely lunch in the Lava restaurant. By the time we left, it was a zoo at check in - Definitely better to be there no later than 11am or even earlier, if possible. Last but not least - Kristen. So very patient with my hundreds of questions and changes. You never got exasperated with me and I must admit I have worn out some travel agents in the past. We really loved our experience and so appreciate all of the work you put into making sure we had a wonder trip. For the past year I have had many communications with Kristín and now sadly our trip is a fond memory. Seeing the Northern Lights has been on my bucket list, but with time constraints to travel to Alaska or other distant locations, after really looking into it, Iceland was the perfect choice from the East Coast. The 4 night Northern Lights Luxury Break package was just what we were looking for and proved to be everything we wanted and more, with input and much help from Kristín. Our adventure was off to a great start the minute we walked through to Arrivals Hall and our driver was right there waiting for us. Since this was a private tour, I requested a couple of changes in the timeline. We had a wonderful very early morning breakfast, did a bit of sightseeing as the sun came up, and then went to the Blue Lagoon for a few hours of luxurious relaxation and a fabulous lunch before heading to Hotel Grímsborgir in Selfoss, our home for the next three nights. We found it to be a lovely place to stay and it was like little home in a development, with our own private hot tub under the stars. In fact it was a studio apartment with all amenities. The staff was wonderful and the restaurant was delicious. The first evening we had a pianist and a cozy fire, which was a nice way to end two long days without sleep. Our guide Helga, pulled up at our little house right on time for our first day of touring. She was friendly, energetic, very knowledgeable, full of Viking stories and folklore and just adorable! Our biggest problem was climbing into the Super Jeep! Not for her. She timed the day very well and we were exhausted and excited after seeing so much of the beautiful jaw dropping South Coast. That evening we saw a gorgeous display of the Northern Lights, which of course is not guaranteed, so that made our trip right there. The next day went just as well as the first, and after having stopped the first day for a packed lunch and eating outside, she suggested that we may like to see and have lunch at Fridheimar, the greenhouse, in the area of the Golden Circle. Well worth going and the tomato soup and bread are a treat. Very interesting spot sitting among hydroponic tomatoes and bees buzzing around them. Our last driver was right on time to take us to Reykjavík where we checked into the Hótel Borg, after he drove us around the city on a mini tour so that we could have a feel of what was there. They upgraded us to a suite overlooking the Square with a balcony. A wonderful and appreciated surprise for our last evening. Our same driver arrived just a bit early the next day to take us back to the airport. He explained that there was a strike and that it may take longer to get through security, which it did. It was nice that he cared. We would like to thank Nordika Travel, South Iceland Adventure, the drivers, and the staff of both Hotels for truly making us feel taken care of, pampered, informed and creating a lifetime of pleasurable memories. To see everything you wanted to, especially when it comes to nature cooperating, on a trip isn’t a given, but we did! Tim and I had a memorable first trip to Iceland in late August and early September thanks to your guidance. We now know why Iceland is called the "Land of Fire and Ice". Much of what we saw was either really hot or really cold. It's easy to see why it's becoming so popular with tourists! There were so many things to see and do and the time passed quickly. Thank you very much for the great planning. The three tours were all excellent, even though two of them were on days when it was cold, rainy and windy. We've told all our family and friends what a great trip it was and how exotic Iceland is. We hope to return one day so we can see more beautiful sites and do more fun things! Attached are a few of our favorite photos from the trip. The trip was Great - really fabulous! Hi - The trip was Great - really fabulous! The hotels were lovely and gracious; the car was fine; the Southern and Western Detailed Itinerary was very helpful - I'll add something about that below - And the sights and things we did were absolutely outstanding! There are a few things that would have been very helpful: 1) we did not know that we should reserve a time at the Blue Lagoon ahead of time because they limit the number of admissions - we went on our last full day rather than on the day we would have been flying out, which was much better for us, but had we not we would not have gotten in at all! 2) Also would have been better to have reserved a ride on the amphibious boat at Jokulsarlon on-line -we were lucky and they had a few spaces! You did not mention going on a glacier walk, which we did near Skogar. It was a bit demanding, but it was great! I found that road atlas really hard to use - I wonder if there's another road atlas easier to follow? Re: the itinerary - we did realize that for us it did not match day to day with our days there. Because of that, for us staying in Vik, if there were a comparable hotel, would have worked better than Hotel Skogar. We went from Hotel Skogar to Jokulsarlon, and had already been to Vik the previous day, so there was some repeat driving - but not a lot! Also, we did not buy the car insurance for gravel roads, so going from Stykkisholmar to Thingvellir meant going down to asphalt road 34 - wish that had been a little more obvious! On our last day we did go to the Viking boat museum near the airport - that was a wonderful exhibit, and the perfect pre-airport way to spend a bit of time - you mention it in the itinerary but hadn't given quite enough about the location! Those things said, we Loved it, and are recommending your services to everyone! And, you were very responsive when we had a few last minute items: being able to go to the Hotel Holt as soon as we got there was great for us! Will send you a few pictures, and thank you so,so much! A belated thank you! We returned more than a week ago from Iceland and had a fantastic vacation. The flights and arrangements worked out well. The hotels that Nordika arranged were nice and at great locations. We were pleasantly surprised! We had one small problem with one hotel: the reservation had been lost on their side, but the hotel arranged a room close by in a sister hotel and free dinner (which in Iceland is not a cheap item ...). But this minor setback was no big deal at all; the hotel owner was very helpful and kind, and the problem was solved quickly. For the rest, our experiences were fantastic: personnel at the hotels were super friendly and helpful, free upgrade on the rental car, free upgrade in the Reykjavik hotel, etc. But the best part was the scenery, the hikes, and all other events we participated in (e.g., glacier hiking, white water rafting) Beautiful country! Thanks for making this trip happen and the many great memory it created for the four of us. Nick has already decided he will go back to Iceland to backpack. Every day was a new and unique experience. We had a wonderful time in Iceland. As a photographer I was in Heaven. Every day was a new and unique experience. I shot whales, churches, water falls, horses fighting and(my personal favorite) puffins. Now I get to relive all of those exciting days, when I photoshop each photo. Thank you for directing us to all of those special places. I just have one question. Do you/and or your company map out trips to other countries? If so, which countries? Following is feedback on our trip. Photos will have to wait. My husband took A LOT and it takes him a long time to process them. First of all, we are very glad we made the entire circuit of the island. Iceland is an astonishingly beautiful country and there is so much to see. We were constantly pulling off to the side of the road to look at something, so, even though, the drive from point A to B was only a couple hours it took us two or three times that long to cover that ground. All of the hotels were very comfortable. Of course, our favorite was the cottages in Reynisfjara. Ragnar was very welcoming, the cottage was lovely and the views jaw dropping. We had one problem at Hotel Hallormsstadur. They put us in a cottage that would have required us to drag our luggage across a rocky path and then up very steep steps. We asked to be relocated to the hotel. They were able to accommodate us in a room in the older part of the hotel, so it worked out. One of my favorite stays was at the IcelandicAir Hotel in Akureyri because it was across the street from the swimming pool! What fun! I went there several times. The car was comfortable and spacious. (We were able to accommodate hitchhikers a couple times and enjoyed hearing their stories.) We decided ahead of the trip to take out the extra insurance for windshield, ash and sand and theft. This is commonly included in rentals in the U.S., but we were glad we did, because we had a cracked windshield by the end of the trip. A loose stone hit it. We did not pay anything extra. Everyone asks us about our trip. There is a lot of interest in Iceland now and we tell people that it is a beautiful island inhabited by very friendly people. Keep it that way!! Great trip - thanks Bjork. If I go again (and we might lead a group next summer) I would spend zero time in the "circle" as the crowds kill you. The west fjords, the east fjords and southern Iceland was the best. We were very inspired by the incredible natural wonders we saw, and very charmed by the friendliness and helpfulness all of the Icelanders we met. I’m sorry I haven’t had a chance to write sooner but our travels in the U.K. have been almost as consuming as our time in Iceland. Thank you for all of your expertise and assistance with our trip to Iceland. The whole experience was really wonderful (baggage problems aside - even here it was your extra help which turned the incident into a minor annoyance instead of a major headache). Every hotel we stayed in was great in it’s own way, and the staff were all very helpful. At several of our stops they even did laundry for us at no charge to help us work through the after effects of the baggage problem! All the tours/guides were very good - and we must specially thank the people at South Iceland Adventure who provided fantastic guides for both my parents on their day of bird watching and for our whole family on our Porsmork Valley tour and our Landmannalaugar tour, and they were wonderful about helping us shift our schedule around at the last minute to move our glacier walk as well. We are already thinking about our next trip to Iceland! - at which point we will be in touch! Loving the non paved roads. We are having a great trip thanks to your planning. Could not be happier. Wonderful route, accommodations, meals. You have thought of everything. Loving the non paved roads. Thanks again. You come from a very special homeland. Thanks for sharing it. THANK YOU! We had a fantastic week in Iceland. Every accommodation was as advertised. The itinerary was very helpful. The clockwise route was the right way to go. AND EVERY SIGHT, STOP, SCENIC VIEW, AND SUGGESTION WERE FANTASTIC. Attached photo - I'm sure you know - is from the glacier lagoon. We have hundreds of others. We want to go back when the Northern Lights are in view. You come from a very special homeland. Thanks for sharing it. We had a very nice trip to the West and South Iceland. The flights were good. All of the hotels were very good, especially Ranga. The Icelandair hotel was okay but far below the others. One important thing to note is that the airport was understaffed and the check-in lines at 6:00 AM were the longest I have ever seen and resulted in flight delay of an hour. The driver and tour of Reykjavik upon our initial arrival was very helpful and informative and the driver was very helpful at the Hertz rental center at the end of his tour. The route that was planned for us was easy to follow, efficient, and facilitated our seeing many, many of the most beautiful and important sites. Overall we were very pleased with the trip and the arrangements made by Atli. Hi Bjorg. Thanks for your note Our trip was excellent! We thought Iceland was awesome, so different from other places and therefore so interesting. I loved seeing all the wildlife…the Icelandic horses, lots of sheep, and we saw wild reindeer and several whales. Thanks for all the arrangements….the tour was great: well planned, great guide, safe bus driver, and all the accommodations were fine. Perhaps the only improvement area was the food choices…could have used more choice especially since at several of the places the dinner was lamb which my husband doesn't like. They did accommodate him but still it would have been nice to have some choices (more fish, chicken or pasta). The whole trip went smoothly. The tour had a nice mixture of relaxation on the bus and exercise through walking trails to waterfalls and scenic places. We also learned a lot about Icelandic history and culture. People were very friendly and everyone spoke such good English so it was easy to do everything. Thank you so much for including this as a stop-over on our trip. My family and I are having a great trip so far and by far and away the best lodging to date has been the Silfurberg Guest House - Country Home. I cannot put into words how absolutely wonderful all of the family treated us and what a beautiful meal they prepared for us. Thank you so much for including this as a stop-over on our trip. Iceland is a magical place and the people we met were delightful. I am sorry to have taken so long to write and thank you for all the excellent accommodations you booked for our trip. 16 days was not enough time to do all we wanted to do and see all we wanted to see, but thanks to convenient places to stay, we were able to hike and enjoy a good bit of Iceland. The only change we made to the itinerary was we changed the ferry ticket coming back from the Westman islands from 11:30 to 8:30. We felt that the extra time could be better spent at Landmannlaugar (were I got to drive through a knee deep river crossing) and we were glad we changed it. Iceland is a magical place and the people we met were delightful. Awakening every morning knowing that this day you will see something that you have never seen before is what travel adventures are all about.